Mount Santubong rises out of the South China Sea a lone mountain. Two rivers meet the sea on either side, a narrow isthmus of land between them. 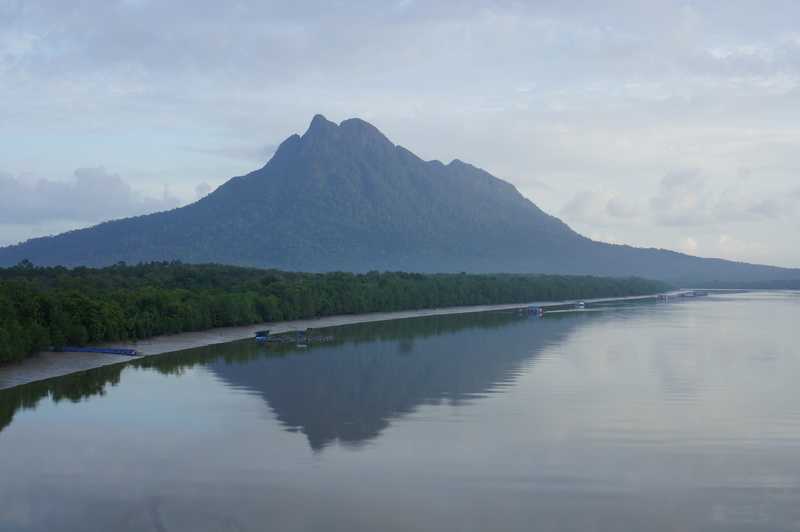 Mount Santubong has its own weather, with clouds cresting, writhing or settling around the peaks most days regardless of what the day brings the flat swamps beyond. No wonder fairy tales are sung about it. Kuching, thirty minutes inland, is a recent settlement, only becoming important in the 1840s with the arrival of James Brooke, the famous White Raja of Sarawak. Santubong, by comparison, has evidence of human activity going back a thousand years. 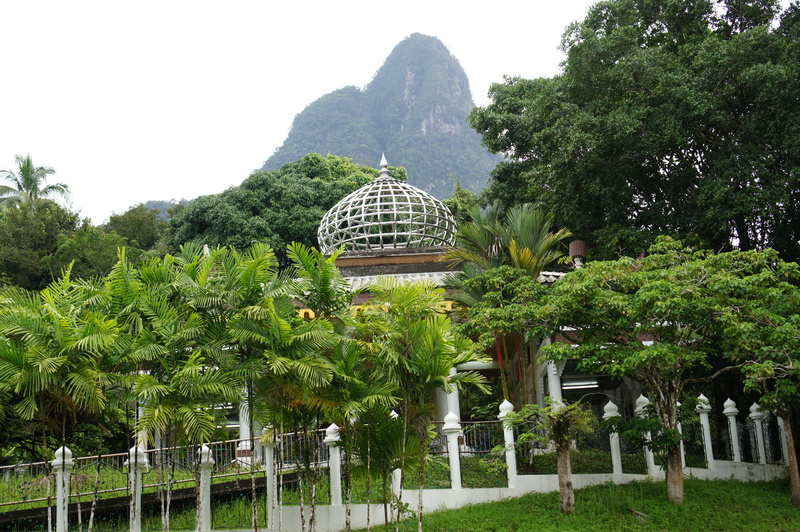 Hundreds of years before James Brooke, Mount Santubong was home to the first and last Sultan of Sarawak, whose final resting place is at the foot of that remarkable mountain. He was known as Sultan Tengah. There are still traces of his memory here and there. I had heard it said that he is the patron saint of the region, and some have related contacting him in dreams and spiritual encounters . He was in any case a man who has returned to his Maker and as such I decided to visit him to read Ya Sin, intending to share its blessing with him bi idhnillah. I arrived on a cool drizzly morning. As I entered the mausoleum, deserted but with fresh flowers upon the grave, I caught the otherworldy scent of Kenanga blossoms . Behind the headstones wrapped in royal yellow stood three large black slabs bearing in English, Malay and Jawi the legend of Sultan Tengah. In the 1500s, Sarawak  was loosely under the rule of the Kingdom of Brunei. The 9th Sultan of Brunei was Sultan Muhammad Hassan, who ruled from 1582 to 1598. When he passed away, the crown passed to his first-born son, Sultan Abdul Jalilul Akbar. Sultan Muhammad Hassan had another son named Pengiran Muda Tengah Ibrahim Ali Omar Shah, who was known as Raja Tengah. According to the oral history, this Raja Tengah also desired the throne of Brunei. Raja Tengah insisted that since his elder brother was born before his father become the 9th Sultan, whereas he was the first son born after his father’s ascension to the throne, he had the greater right to inherit the kingdom. Sultan Abdul Jalilul Akbar was a clever man. He understood the delicacy of the situation and tried to appease his brother’s desire. He saw a way to resolve the conflict by appointing Raja Tengah as sultan somewhere else. So it came to pass that Raja Tengah was named Sultan of Sarawak, seeing as the region was loosely under the rule of Brunei and was at the distant reaches of the realm. In the shadow of Mount Santubong. According to the annals of the kings of Brunei, Sultan Tengah accepted the appointment and made preparations to depart for Sarawak. He was accompanied by more than 1000 soldiers from the Sakai, Kedayan, and Bunut tribes of the indigenous peoples of the island of Borneo. A number of members of the court also went with him to aid in the establishment of an administration in the new realm. It is mostly from this delegation that the Malays of Sarawak trace their lineage today. Upon their arrival, the new Sultan and his followers built a palace and a fortified wall around it. Sultan Tengah began to appoint his deputies and arrange the kingdom’s affairs. Among the positions that he designated were Patinggi Datu Seri Setia, Datu Shahbandar Indera Wangsa, Datu Amar Setia Diraja and Datuk Temenggong Laila Wangsa. Only when all was settled did Raja Tengah began to use his new title, Sultan Ibrahim Ali Omar Shah, First Sultan of Sarawak. The grave of Sultan Tengah, under a perforated dome open to the rain. Around 1599, Sultan Tengah visited Pahang, then a part of the Kingdom of Johor, to visit his aunt Raja Bondan who had married Sultan Abdul Ghafur Muhyiddin Shah Ibnu Sultan Abdul Kadir Alauddin Shah. While he was in Johor, Sultan Tengah was asked to perform a courtly dance. While doing so, the handkerchief of his dance partner nearly struck him in the face. Sultan Tengah became enraged and slapped the offending man. This made the Sultan of Johor terribly angry such that he demanded Sultan Tengah leave Johor immediately. According to the history passed down from the Sultanate of Sambas, Sultan Tengah, known to Sambas as Sultan Abdul Jalil, was forced to leave Johor because he rejected Raja Bondan’s offer to marry her daughter the Princess Cik Zohra. During the return voyage to Sarawak, Sultan Tengah’s boat was caught in a fierce storm, losing its rudder. His boat washed ashore in Sukadana, on the western coast of Borneo in what is now the Indonesian province of Kalimantan Barat. Sukadana was under the rule of Raja Giri Mustika, who had adopted the title Sultan Muhammad Saifuddin after converting to Islam through the assistance of one Shaykh Shamsuddin, an Arab from Mecca. Sultan Tengah was well received in Sukadana, and studied the religious sciences under Shaykh Shamsuddin throughout his time there. While in Sukadana, Sultan Tengah married a younger sister of Sultan Muhammad Saifuddin named Puteri Surya Kesuma. He intended to reside permanently in Sukadana and requested permission to spread the teachings of Islam to the people of the area. 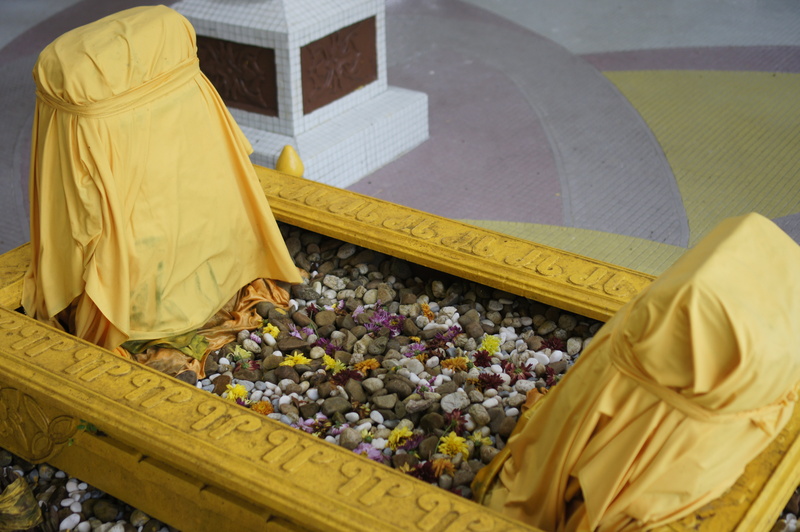 Gravestones at the head and foot, wrapped in royal yellow cloth. Sultan Tengah was only granted permission to spread Islam to the lands around the Sambas River, much further to the north. So, in 1600, Sultan Tengah left Sukadana for the Sambas River with 40 boats equipped with men at arms. Sailing up the Sambas River, they landed at Kuala Bangun, where Princess Surya Kesuma gave birth to a prince named Radin Sulaiman. She was later delivered of two more princes as well during their sojourn in Sambas. The second prince was known as Pengiran Badaruddin who later became Pengiran Bendahara Seri Maharaja. The third prince was Pengiran Abdul Wahab who later became Pengiran Temenggong Jaya Kesuma. Finally, Sultan Tengah arrived in Kota Lama, Sambas. There he was met by the King of Kota Lama, Ratu Sepudak, who received him with the highest honors and stately protocol. Sultan Tengah learned that Ratu Sepudak would allow him to spread Islam in his realm even though he was not himself a muslim. After a long period of stay in Kota Lama the eldest son of Sultan Tengah, Prince Radin Sulaiman, married the daughter of Ratu Sepudak, the Princess Mas Ayu Puteri Bongsu. They had a son named Radin Bima who would later become Sultan Muhammad Tajuddin of Sambas. When Ratu Sepudak passed away, he was replaced by Pengiran Prabu Kenchana who was appointed by Radin Sulaiman as one of his advisers. The story goes that Ratu Sepudak desired that the throne should pass to Sultan Tengah due to his experience in governance, but the matter was contested by members of the royal court. Thus it was around 1630 that Sultan Tengah went to Matan. There, he married a princess of Matan who gave birth to a son, Pengiran Mangku Negara, who later became the Sultan of Matan. After staying a number of years in Matan, Sultan Tengah decided to return to Sarawak. As the voyage neared its end, he stopped at a place known as Crocodile Rock at the mouth of the Santubong River. There he was murdered by one of his own followers. When the news of Sultan Tengah’s death reached Sarawak, Datu Patinggi, Shahbandar Datu, Datu Amar and Datu Temenggong went to Santubong to arrange for a burial in keeping with the traditions of the Brunei Sultanate. It is said that he died in 1641, ten years after Radin Sulaiman became Sultan Muhammad Saifuddin I of Sambas. Sultan Muhammad Saifuddin I was succeeded by Sultan Muhammad Tajuddini, and the rest of their long lineage is a matter of record of the Sultans of Sambas down to the present day . 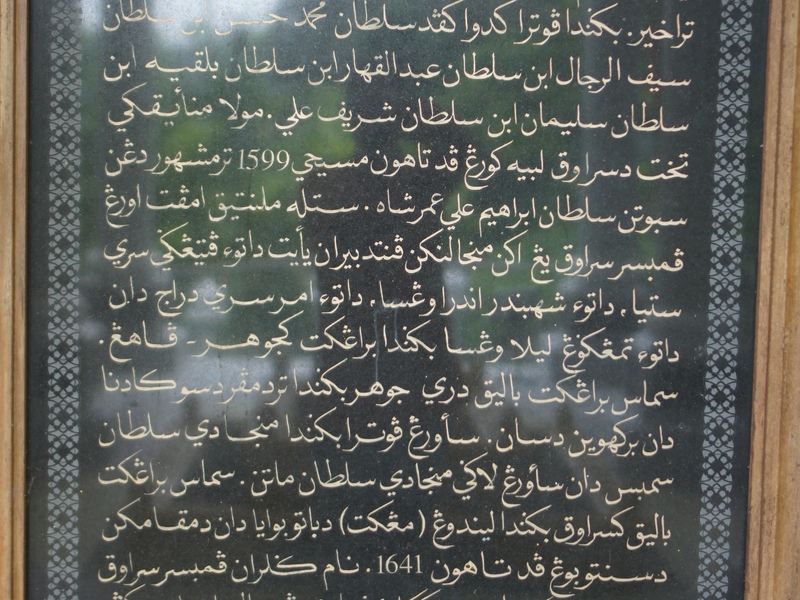 An brief account of the Sultan’s life in the Malay language in jawi, a modified arabic script. 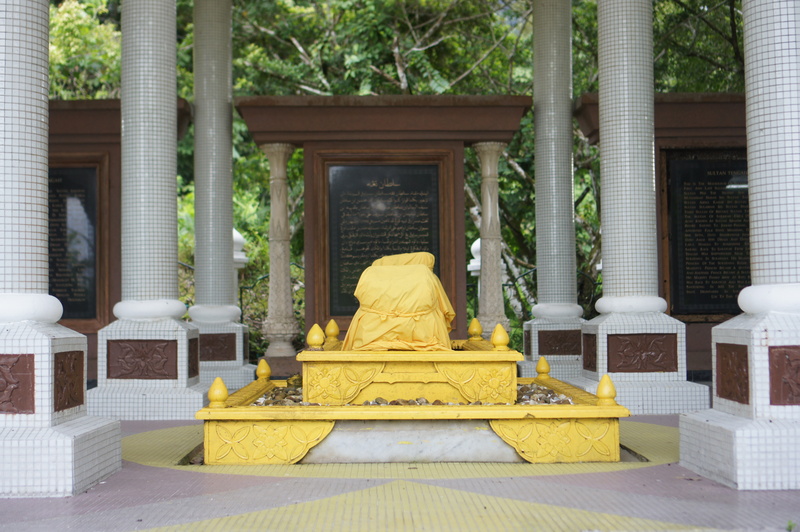 Sultan Tengah is buried near the village known today as Kampung Batu Buaya Santubong. The ancient headstone marking his grave is consistent with that of a sultan. With the death of Sultan Tengah, the Sultanate of Sarawak came to an end, the span of the realm the life of a single man. Sarawak eventually reverted to the control of the Sultan of Brunei. Even so, the titles bestowed by Sultan Tengah on his deputies continue to be used for the Sarawakian ruling elite to this day. Reader, what I have translated and arranged above has reached me without author or attribution and I myself can not confirm or deny a word of it. It is curious though that the memory of the adventures of Sultan Tengah – Founder of dynasties, Spreader of Islam! – is strongest in the Sultanate of Brunei to one side of Borneo and the Sultanate of Sambas to the other, proving true his name: Sultan Tengah, the Middle Sultan. 1. Puteri Santubong, the fairy princess transformed into a mountain. 2. Others say the fuss to commemorate the grave was a calculated act of flattery to attract investment from the wealthy present-day Sultan of Brunei, wallahu alam. 3. 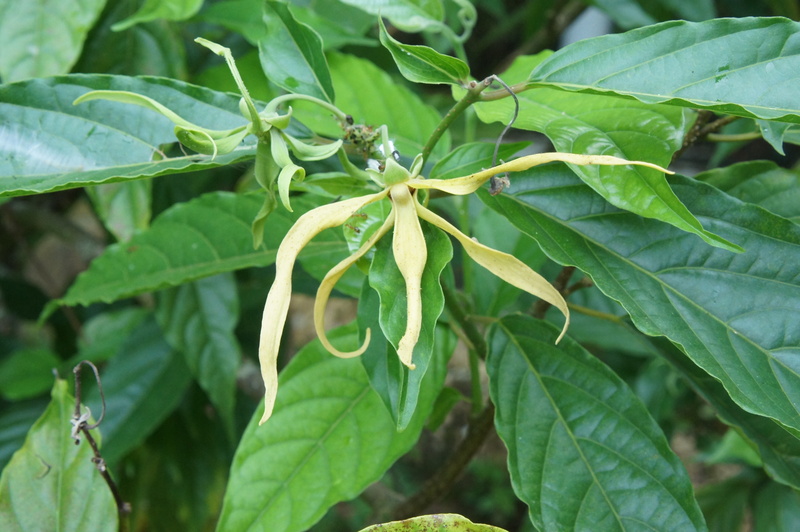 Kenanga, also known as Ylang-ylang, is Canangium odoratum, a tree often planted near mosques, maqams and cemeteries where its otherworldly aroma brings to mind the unseen world waiting for us all. Its essential oils are also ingredients in fancy name-brand perfumes. 4. Sarawak at that time referred to a smaller territory than it does today, perhaps what is today the westernmost division of the state. 5. The Malay Archipelago contained dozens of princes and kings. In Indonesia, many royal houses became collaborators with the Dutch and were swept away with Independence. The Sultans of Sambas survived and have been accommodated by the Republic of Indonesia as “Head of the Sambas Sultanate for Domestic Affairs”, a hereditary administrative post similar to but less grand as the Sultan of Yogyakarta. More on the Sambas Sultanate including accounts of Sultan Tengah’s presence here. 6. See Of Dukes and Datuks for more on the Malaysian system of peerage. 7. Pantun found here, author unknown. English translation mine. Note: The narrative of Sultan Tengah’s life that I have translated here comes from an email from a facebook page from an anonymous message-board posting and from there I gave up. If the author of the original Malay text would like acknowledgement here, please contact me. There are several other versions of the story floating around which I have made no attempt to reconcile.